Aerotel Medical System, an Israel based company specializing in telemedicine and telecare solutions has just unveiled a new series of personal safety devices targeting for senior citizen as well as for children. There are two models being released – GeoSkeeper with GPS (Global Positioning System) assisted enhanced security features and Skeeper with entry level safety functions. In terms of functionality, both are quite similar except GeoSkeeper has advanced features utilizing GPS technology for personal location tracking. With GeoSkeeper function, users will be notified if they have crossed a specified boundary such as neighborhood area. 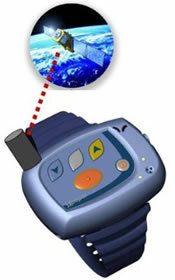 Once activated, a SMS (Short Messaging System) will be triggered and sent to dedicated recipients for acknowledgement. For entry level Skeeper, it has quite complete security features based on normal quad-band GSM cellular network. Users will be able to have two-ways communication in any emergency situation . Also, assistance from remote center is available round the clock once the alarm system is being triggered. The company will be showcasing both solutions at upcoming Mobile World Congress 2008 events in Barcelona.